Castle Hill, get ready to putt your stuff! We have brought the life and the hole of the party to Castle Towers Shopping Centre! 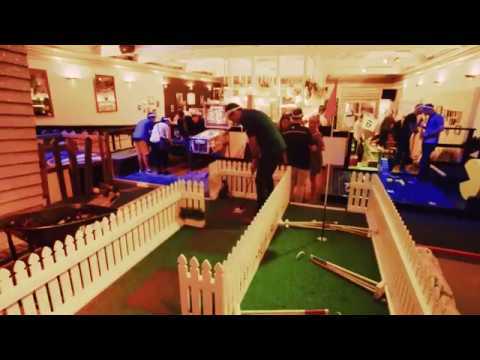 We’re not your regular mini golf course either, we bring fun to a new level. Tee off around 18 uniquely themed holes over two courses. Finished putting your stuff? Hit up our private karaoke room to really let loose. After you have worked up a thirst, our full service bar, The Caddyshack will take care of all your off-the-green needs. With drinks, cocktails, food and tunes on offer we've got you sorted. Monday from 5pm, spend $7 on Food or Drinks and we’ll give you 9 Holes of Mini-Golf for free so you can really putt loose! Head into Holey Moley every Tuesday after 5pm and if you grab 9 Holes of Mini-Golf, we’ll chuck in another 9 holes. Hows that for generous? From 5pm every Wednesday we are doing Unlimited Activities for $25! How's that for a deal? Every Thursday from 7pm we are hosting Trivia! Come down and test your knowledge. Did someone say Happy Hour? From Monday - Thursday, 5pm - 7pm we've got $5 beer, wine and basics plus $10 selected cocktails. Cheers to that! Worked up an appetite in the office or on the course? Swing by Holey Moley where we will be serving up a Burger and Fries for $15 every day from 12pm - 3pm. Okay, let’s get to the point. What's the deal with alcohol at Holey Moley Castle Towers? The rumours are true. We have a fully licensed bar and a delicious list of cocktails. You ALWAYS need your ID to enter our Castle Towers venue and they will be scanned as of 8pm (Even if you think you are too old, this also applies to you). What can we do before and after our rounds at Holey Moley Castle Towers? How do I book at Holey Moley Castle Towers? How long does the golf stuff take at Holey Moley Castle Towers? What if I wanna bring the whole squad to Holey Moley Castle Towers? Can I bring the kids to Holey Moley Castle Towers? Where do I park at Holey Moley Castle Towers? The Purple Carpark outside the Event Cinemas is the best place to drop your buggy. Can I just turn up to Holey Moley Castle Towers? Can I cancel or change my booking for Holey Moley Castle Towers? How do I get to Holey Moley Castle Towers on public transport? Take the Hills bus route up Old Castle Hill Road and jump off outside David Jones. Jump onto the NSW public transport journey planner here and map out your journey. Where is Holey Moley Castle Towers located? Holey Moley Castle Towers is located on the level 2 piazza, across from the Bavarian. If you walk out the doors of the Event Cinemas and up the stairs you can't miss us! Do I need to bring my ID to Holey Moley Castle Towers?